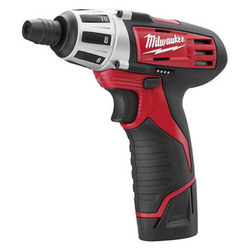 Milwaukee's M12™ Cordless LITHIUM-ION Screwdriver is powerful enough to drive most common and small fasteners. Minimal recharging required - has a high run-time of full day screwdriver use without recharging. Screwdriver's small, compact size fits easily in tight places for those hard-to-reach jobs, meaning increased convenience and usability. Capacity in Steel: 1/4 in. Capacity in Wood: 1/2 in.